Yes, the shovel was really that big! Photo by Steve Hymon/Metro. After many, many years of planning and advocacy, the Gold Line light rail extension to Claremont and Montclair held a ceremonial groundbreaking before a big crowd this morning at Citrus College in Glendora. 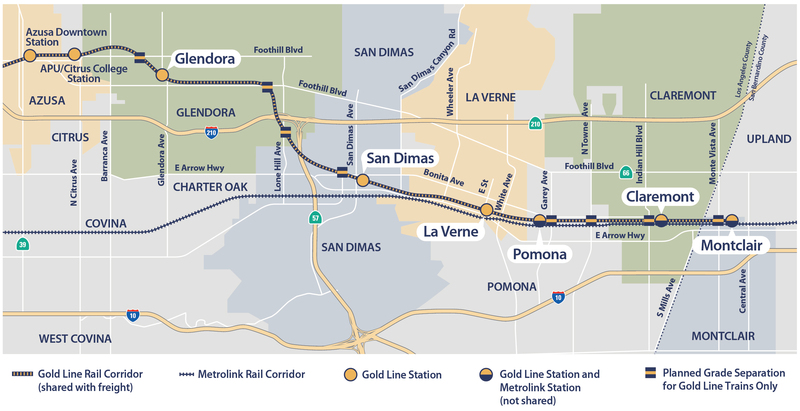 The project will extend the Gold Line east from its current terminus in Azusa for 12.3 miles with new stations in Glendora, San Dimas, La Verne, Pomona and Claremont. 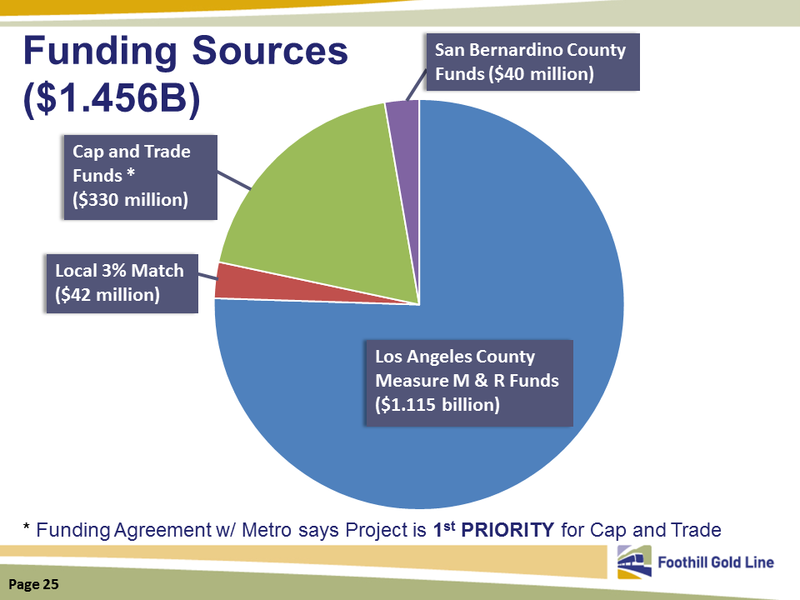 If funding is secured from San Bernardino County, an additional station will be built in Montclair (Metro only funds projects in Los Angeles County). The first three years following groundbreaking will be spent relocating utilities, hiring the design-build team and finalizing the engineering plans. Major construction — which requires the complicated task of relocating existing freight and Metrolink tracks and systems — is forecast to be completed in 2026 with the extension opening in 2027. The Gold Line project will provide riders with a fast, high-capacity transit alternative to the congested 210 freeway that cuts across the northern San Gabriel Valley. The line will also provide easy walking, biking or bus connections to nearly two dozen colleges and universities, the L.A. County Fairplex, parks and open space and more. The nearly $1.5-billion project includes $1 billion in funding from Measure M, the sales tax ballot measure approved by county voters in Nov. 2016. This is the first major Measure M project to break ground and will join several others in the next few years, including the Purple Line Extension’s third phase (between Century City and Westwood) and a new rail station for the Crenshaw/LAX Line and Green Line at LAX. 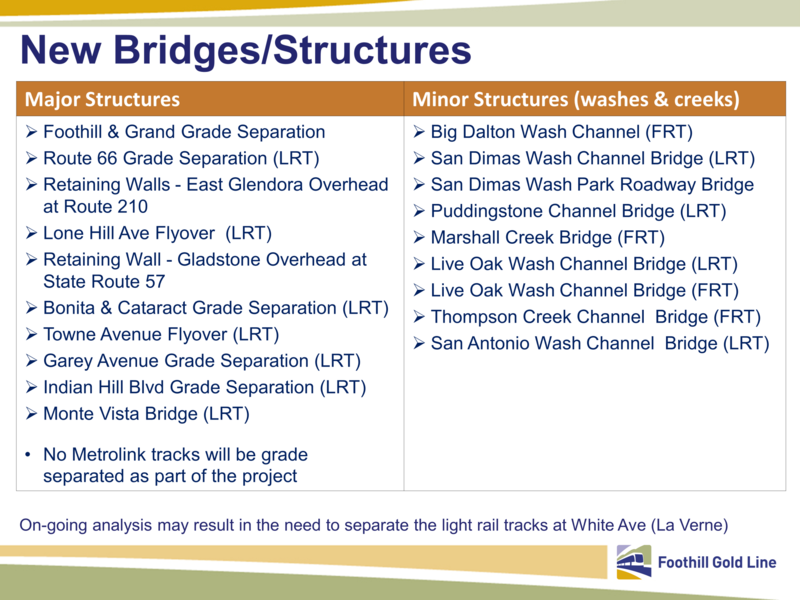 The project will be built by the Foothill Gold Line Construction Authority, an independent agency created by the state. When completed, the Authority will hand over the project to Metro, which will operate it as part of the Metro Rail system. •There will be parking at each of the six stations. Metro, the Construction Authority and the Foothill Cities are working to determine how much parking is needed based on parking demand models that take into account parking fees. Original plans call for 5,180 spaces, some in shared facilities with Metrolink. •The project needs an additional $279 million to be built as planned. Metro is working to secure state cap-and-trade funds to fill the shortfall. The Metro Board has also asked Metro to study whether to eliminate the Claremont Metrolink station instead of relocating it, which is a more expensive proposition. 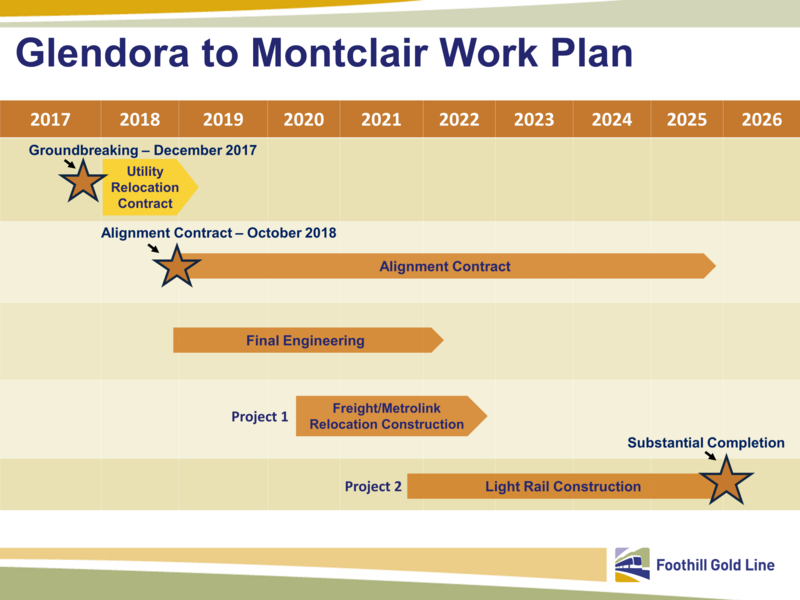 •When done, the Gold Line extension to Claremont and Montclair will connect to a Metro Rail and bus rapid transit system that will be considerably larger than today. One project of note for all current and future Gold Line riders: the Regional Connector project will allow trains from Azusa — and Claremont and Montclair in the future — to run directly into the heart of downtown Los Angeles. That eliminates the need to transfer to the Red/Purple Line subway at Union Station and will save Gold Line riders several minutes or more in travel time. Really makes no sense that there isn’t going to be a stop at Lone Hill Ave, which on the map, appears almost exactly half-way between Glendora and San Dimas stations. The Lone Hill/Gladstone area is a MAJOR destination for shopping and eating out! It’s not any different from where the Blue Line misses stopping at the big Compton shopping center and instead stops in the middle of a bunch of warehouses at Compton station. The auto oriented uses are too scared that their parking lots will be taken up by transit riders, but transit riders need to buy stuff at big box stores too! It is also a junction of the 210 and 57 Freeways, plus there is an existing Park & Ride that could be utilized and expanded. I have suggested that a station be at least prepared for, but that does not seem to have borne any fruit. will make the remaining 12.3 mile trip from APU-Citrus to Montclair in just 19 minutes. That’s 1.54 minutes per mile or an average speed of 39 MPH going non-stop. I’d love to see what acceleration rates the Foothill Construction Authority is proposing. it makes sense when you take into account the green line’s southwestern segment, with close station spacing and a relatively low rate of speed between aviation/LAX and douglas. That brings the average down quite a bit. Good point, but then I notice that the current Gold Line from Sierra Madre Villa staton to Arcadia staton takes 5 miles to go about 3 miles. If you’ve ridden it, you’ll agree that it is one of the fastest segments on the present Gold Line. 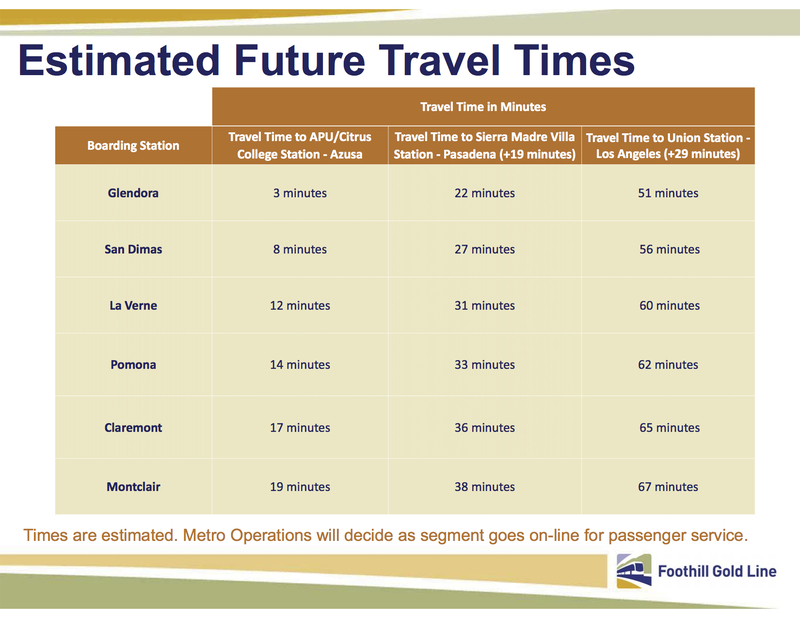 That’s 1.667 minutes per mile or 36 MPH, well below the 39 or 43 MPH the Foothill Construction Authority is claiming it will operate at in the above graphic. The Gold Line slows way down as it gets to the Highland Park station. I can see where the Gold Line may go faster on the extension to Montclair, since Metro is finally doing the smart thing, and elevating the trains/grade separations as most busy intersections! I wrote and submitted the Lone Hill Stop- built into the proposed bridge- every hearing i could. Deaf ears.. It looks like each city got one station, and placed it at the best location for that city. So the Pomona and La Verne stations are one mile apart, while San Dimas and Glendora are four miles apart. I’m not sure if this is due to urban characteristics or politics — probably a little of both. In the Lone Hill/Gladstone area, the tracks go right between Costco and Walmart, in a part that’s highly paved over and car-oriented. While a station there could make some sense, it would probably have less impact than the planned locations of the San Dimas and Glendora stations. Given the constraint of one station per city, I’d say both San Dimas and Glendora chose wisely. Are we supposed to run these new line with old trains or are new light rail trains being ordered/considered? Once the Regional Connector Tunnel in DTLA is built and opened, all the cars on all the lines (except in practice, the Green Line, though it is possible) will operate throughout the Light Rail system. 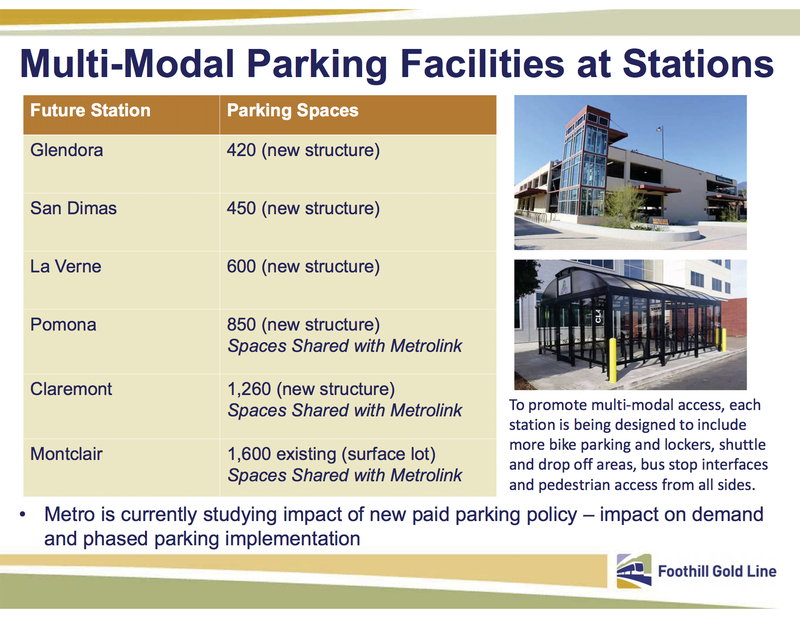 So depending on when the Foothill Phase 2B opens, it is possible that all the car models that are on the system today (except for the P0856s) will be running to Claremont/Montclair. Can Metro pay to operate a train, and maintain the tracks it runs on, once that train leaves Los Angeles County? Has a source of funding to do the operation of the Light Rail line east of the county line to Montclair station been identified yet? It is one thing to build the tracks, but another to run trains and maintain those tracks. If Metro cannot legally pay for this, who does? By the time this thing opens it will not be the gold line anymore. (I know they’re also talking about giving the lines new letters or something.) But minimally it will at least be the northern leg of the blue line to Long Beach. 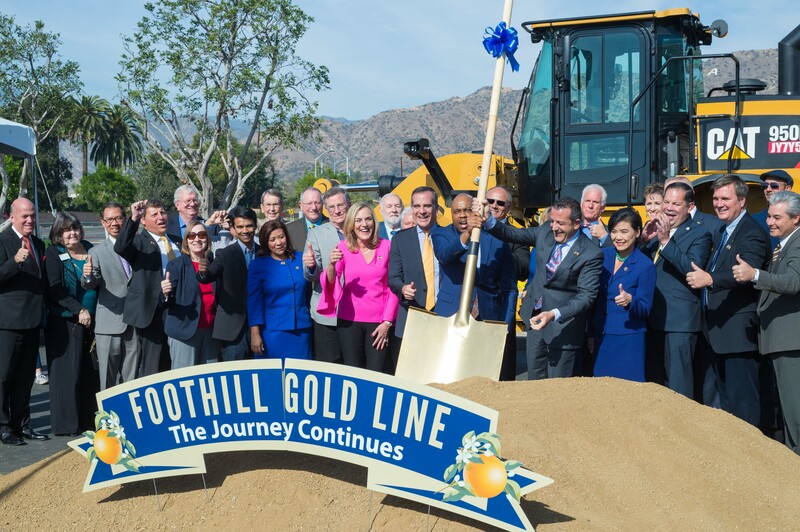 So, we’re kind of going full circle here–remember the “Pasadena Blue Line?” It seems silly to keep having gold shovels and such!